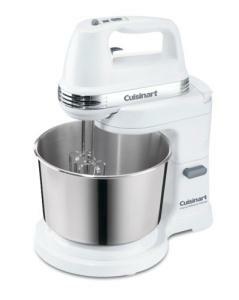 The Cuisinart Power Advantage Mixer has a one step power switch and seven speeds with three low mixing speeds. The speed function has an LED display. Two hundred and twenty watts of power are available, yet the SmoothStart feature helps by beginning the mix slowly to reduce splatter and splash. The model comes equipped with a tilt back head, easy release hand mixer button, and a 3.5 quart stainless mixing bowl. The set comes with flat mixing beaters, dough hooks, professional chef's whisk, instruction/recipe book, and a limited three year warranty. The beaters, hooks, whisk, and spatula are top rack dishwasher safe and the bowl is dishwasher safe. This machine allows the beaters to spin the bowl for better mixing. This can leave some dry ingredients in the center, but it isn't designed to work completely without scraping. This set allows you to get all of the features of a hand mixer and some of the features of a stand mixer, but this is not a stand mixer in power. As long as you don't expect it to be, you shouldn't be disappointed. Mounting a hand mixer allows it to be balanced to better serve you. This would be a nice option for anyone who might have trouble manipulating a regular hand mixer or holding the bowl and mixer at the same time. The unit has some very nice features, like a beater eject lever, so no pulling is needed. The tilting head makes working with and removing the bowl easy. The user guide contains some quite helpful basics meant to assure you get the best from your mixer and recipes. Compare this with the Sunbeam MixMaster.